On my first day in Hong Kong, the bloggers and I attended a few presentations that helped to give a great overview of Fancl. 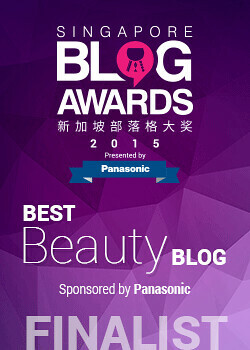 Obviously, we know that Fancl is a Japanese skincare brand, and that it has a strong focus on natural products. The basis for this focus, goes all the way back to Fancl's founder, Mr Kenji Ikemori, who originally started the brand as he was looking for better skincare for his own wife. The brand's philosophy (that you might often see on their packaging) is "无添加", or literally "nothing added", and in this case, it refers to the brand's focus on reducing the likelihood of skin sensitivities and allergies by adding nothing harmful. 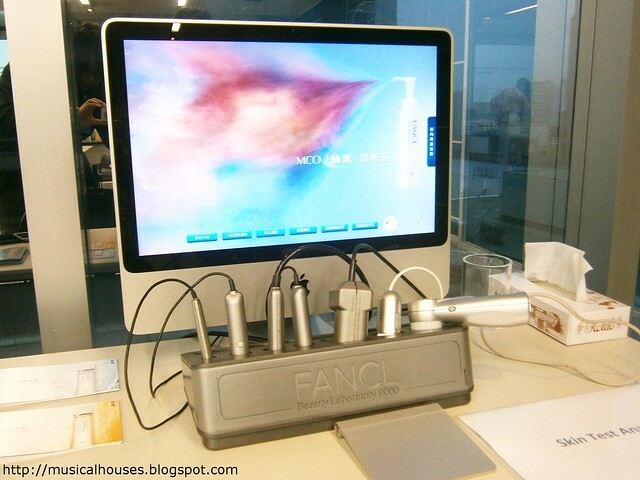 In Fancl's case, the focus is on being preservative free and harmful-additive-free. The theory behind this is that the less you add, the less likely your skin will react to the product. In this case, Fancl boasts of being the largest preservative-free brand in Japan. Given that most products do need preservatives and additives to maintain stability and prevent spoilage, how does Fancl do that? As I eventually go on to the product reviews, we'll take a look at some individual products in more detail. But for now, what I gathered from the presentations and the questions asked, is that it is a combination of 1) engineering the products so that they can be as stable as possible even without such ingredients, 2) the packaging, which is hermetically sealed to maintain freshness, so that once the products are in the container, they stay fresh for as long as possible, 3) small product sizes, that ensure the freshness of the product. Fancl isn't kidding about the small product sizes. I know a lot of us are used to large sizes for some types of skicnare (e.g. lotions coming in sizes of 150ml and the like), but with Fancl, everything is in small sizes of around 30ml for face products, and the products are all clearly marked with the manufactuer date and expiry date. Fancl is also pretty strict about when you should use up their products. From the time you open them, the brand urges you to use up the products within 60 days, while it is still fresh. Below is a full-sized emulsion product for the face, held in my hands to show you how tiny the bottle is. And yes, that is the actual retail size. They really aren't kidding about the "small packages to be used up quickly" strategy! We also got to watch some pretty cool product demos featuring the brand's star products. One interesting one was the demo featuring the Mild Cleansing Oil. 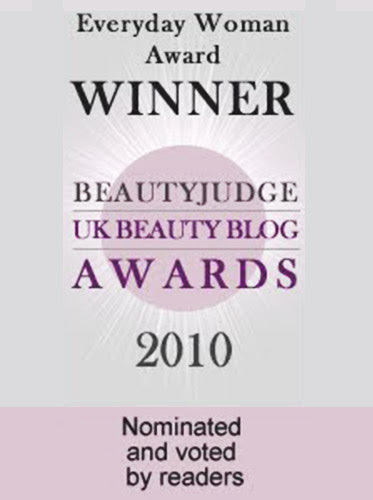 The Mild Cleansing Oil was actually a favourite Fancl product of mine that I used some years back, so I was happy to see that it was one of the brand's best sellers! 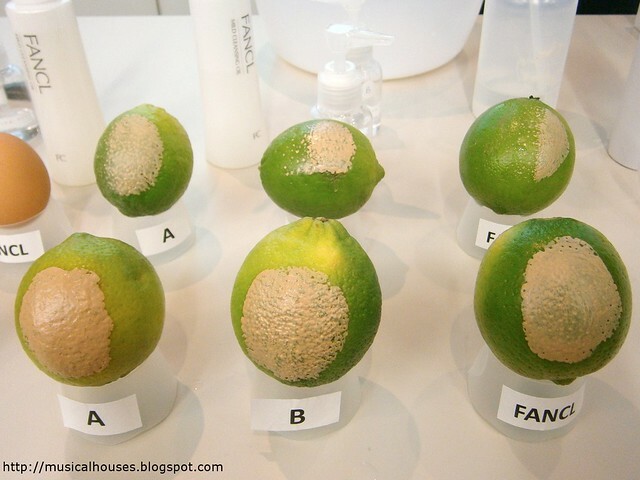 Below, the second row of lemons shows the cleansing power of the Fancl Mild Cleansing Oil as opposed to other unnamed cleansing oils. I'm not sure how much you can see from the photo, but basically the Mild Cleansing Oil, when compared to the other two oils, got most of the makeup off, and without leaving behind any oily film or residue on the fruit. And this did sit well with my own experience of the product - when I used it back in the day, it rinsed off easily and did remove all my makeup without leaving behind any residual oily feel. An interesting tidbit of information that I learned was that Fancl is always working on improving the formula of their Mild Cleansing Oil, although they don't necessarily relaunch the product each time the formula is tweaked. So far, there are 7 "generations" of Mild Cleansing Oil, and each time a change has been made, it was either to accomodate the makeup removal needs of the day, or to improve its skincare qualities. For example, the formula improvement in "Generation 3" of the Mild Cleansing Oil was made to remove waterproof lip products, and "Generation 6" was released to better remove false lashes effectively. This latest iteration of the Mild Cleansing Oils was tweaked to better dissolve the oil plugs in skin. So learning that was pretty cool! Another demonstration that was really popular among the bloggers (it certainly got us talking and held our attention!) 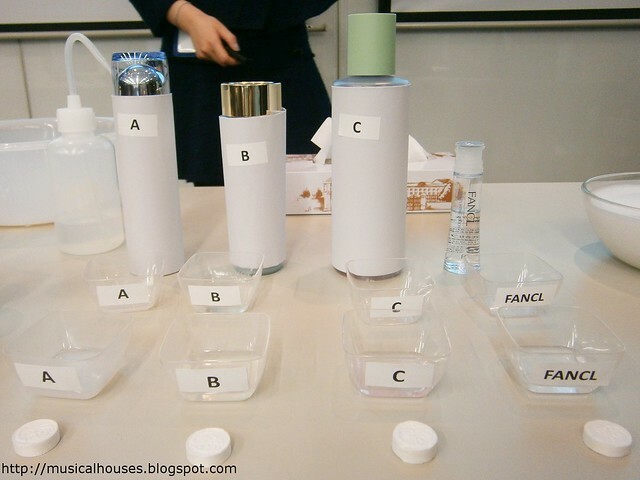 was the demonstration of their Moisturizing Lotion as compared to other unnamed brands. The labels and bottles were all covered up and marked A, B, and C, but as a beauty addict I definitely could guess some of the products because I'm a product junkie like that. As you can see, we poured the lotions into little trays, and then took a sheet mask tab, and let it soak for a few seconds in the lotion in each tray. The idea was to see how fast the sheet mask would absorb the lotions. 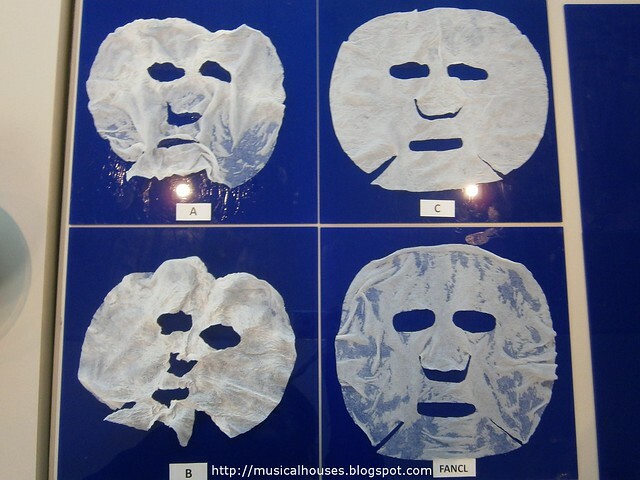 As you can see, the Fancl Moisturizing Lotion was clearly absorbed by the sheet mask much faster than the other three. In particular A and B were slower to absorb, and you can see the sheet masks are still quite dry as compared to the Fancl one. C absorbed pretty fast, but a quick smell test of the mask showed pretty quickly that the mask had a strong alcohol scent, so the quick absorption was partially due to the presence of alcohol in the lotion. So by comparison, the Fancl Lotion was remarkable because it managed to be quick-absorbing without the use of alcohol. I'm also told that the Moisturizing Lotion uses a lecithin membrane to deliver ingredients to skin over time - basically the menbrane functions as a sort of timed-release mechanism. With this, Fancl claims that its Moisturizing Lotion has the ability to hydrate skin for 8-10 hours. Another interesting activity was our individual skin analyses! 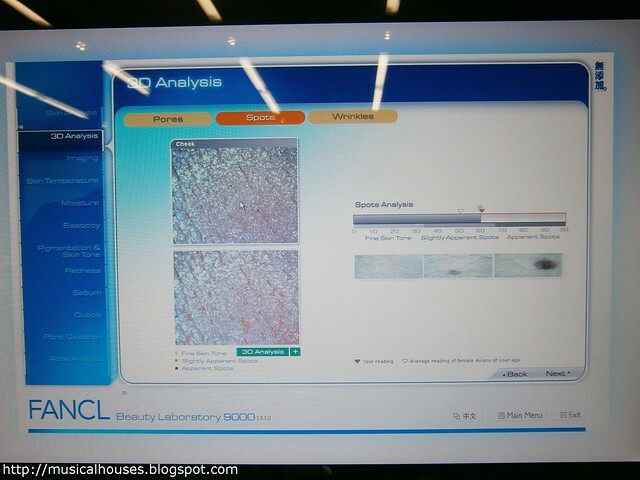 Basically for the skin analysis, a technician uses the machine shown above, and puts one of its probes up against your skin. The probes have different functions, but most of them basically are cameras that zoom in and give a close up view of your skin and identify damanged areas, allowing you to look at your skin condition. This activity could be either fun, or scary, depending on your expectations - I certainly expected to do average, but of course I hoped for a diagnosis of "good" skin! Above, you can see one of the close-up photos taken of my skin. This particular analysis is looking at dark spots, and apparently although the damage isn't always visible, my level of dark spots is supposedly an average amount for my age. Another thing we had fun with was the Foaming Ball. Basically, this is the the Fancl equivalent of the loofa or bath sponge, and is meant to be used with another of Fancl's iconic products, the Washing Powder. The Washing Powder, as you can see in the photo above, is literally cleanser in powder form - it comes out as a white colour, scentless powder, which you mix with water. To get this mixture to foam, you use the Foaming Ball! 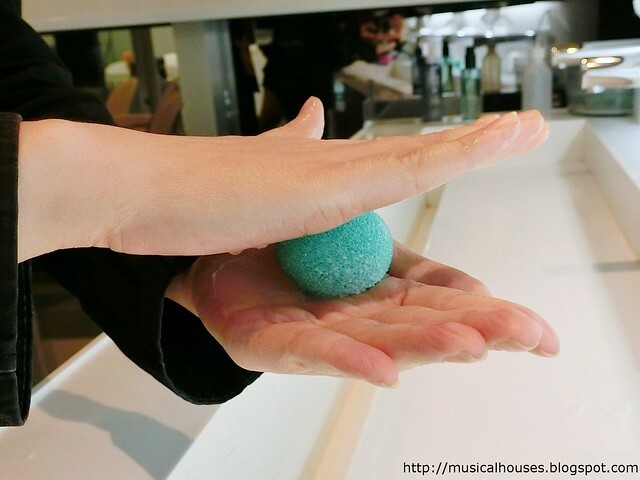 Unlike a loofa or a sponge, the Foaming Ball is only meant to be used for generating a nice foam for cleansing skin with, and is not meant to be used directly on the face - it's not exactly super-soft and might feel quite rough on skin! 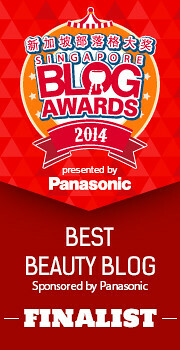 So how do you use the Foaming Ball to get that nice, rich lather for washing with? Basically, after pouring out some of the Washing Powder and adding water, you hold your hands in the position above, sandwiching the Foaming Ball from above and below. 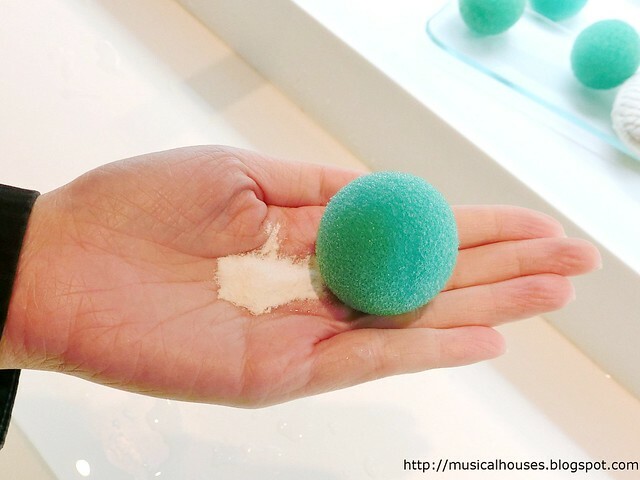 In this position, you roll the ball around in your hands, and the combination of the Foaming Ball, together with the Washing Powder and water, will start to generate foam pretty quickly. Fancl recommends using 2 tablespoons (or 2 pours) of the Washing Powder in order to generate enough foam for each wash.
As you can see above from the peek into my hands mid-rolling, you get a thick lather. Once you think you've gotten enough foam to wash your face with, then you can stop rolling, and put the Foaming Ball aside, and wash your face. You can reuse the Foaming Ball for future uses, but in order to ensure that the Foaming Ball remains hygienic, Fancl recommends that you replace your Foaming Ball every 1 to 2 months. To get the last bit of foam out, you can actually squeeze the ball (like I'm doing in my hands, above). The Foaming Ball itself does trap quite a lot of foam, so don't forget to get it all out! And voila - nice foam! I know it doesn't look like a lot, but this was my first time trying to use the Ball, but you do get much better and quicker with a little practice. On a totally unrelated side note, I may or may not have done the tutorial above while making all sorts of extremely immature "playing with balls" jokes - yes I kind of mentally regress to the state of a 15 year old boy sometimes. I suppose ball jokes never get old, haha. So that's basically what I learned through the Fancl presentations and demonstrations! I was quite impressed by some of the pretty cool and unique products they have, like the Foaming Ball and Washing Powder, and was happy to be reacquainted with my favourite Mild Cleansing Oil again. I also found the Moisturizing Lotion demo to be particularly convincing (the ingredients nerd in me is totally going to look up the ingredients in the other 3 lotions just to compare out of curiousity now). In my next post we'll be looking at the Fancl stores, as well as some of the pretty cool finds in those stores. This was really interesting - looking forward to part two. 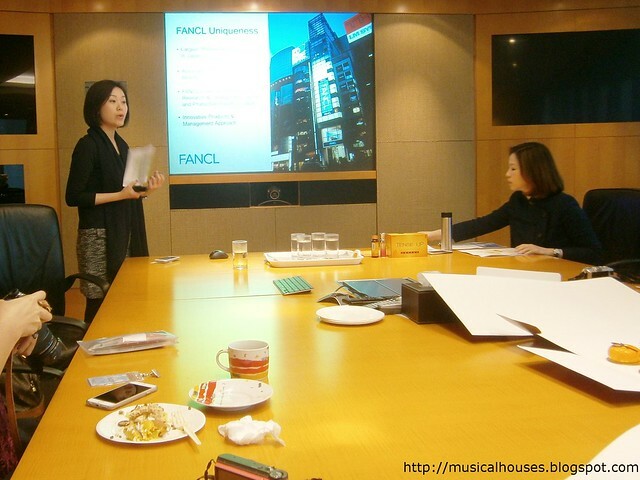 I didn't know all this info about Fancl so I'll definitely check it out next time I visit Tokyo. 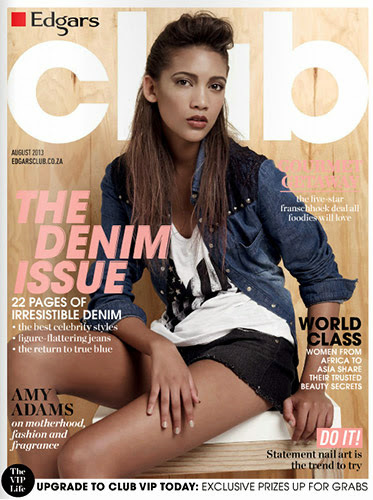 Glad to hear that Fancl is returning to SG! :) Yay!! !